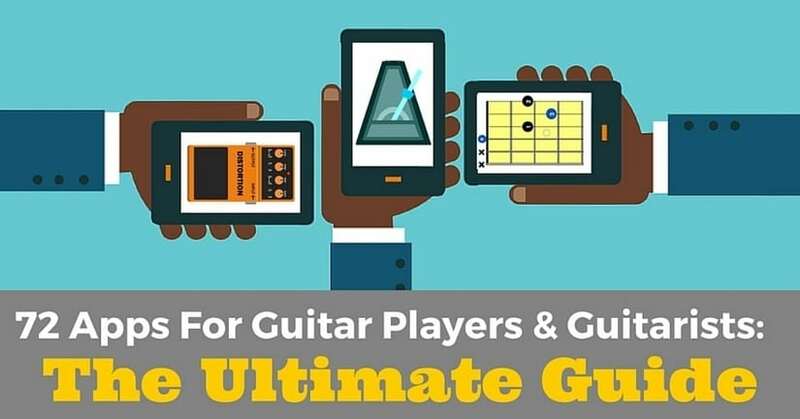 An app to help learn guitar scales and improvisation. 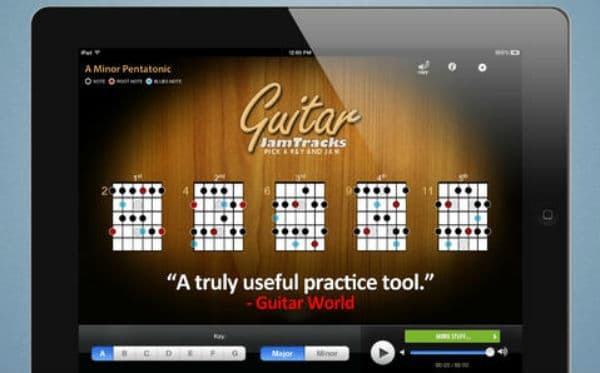 Guitar Jam Tracks has 5 backing tracks to practice with. They’re called: acoustic blues, humbucker blues, jazz, modern rock and reggae. It includes an in-app purchase option for Garage Rock and the ability to load in tracks you’ve written in GarageBand and other apps. I just wanted to learn my major and minor pents and this is great to put in some hours working the entire neck of the guitar. This a great tool for practice and over a week I’ve already broken out of my little box I was always playing in. I only wish there were more tracks to jam with or at least the ability to change the tempo or also the ability to change the chord progressions. But for the price of a burger you get a great tool. Buy it. 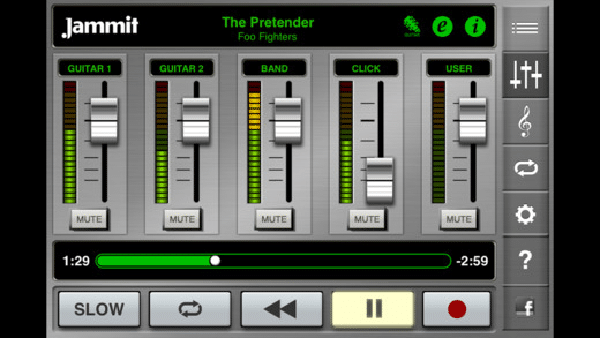 Turns your iPad, iPhone, or iPod into a mini recording studio complete with a collection of instruments. This app also makes it easy for you to plug an electric guitar in and play through classic amps and stompbox effects. You can build backing tracks with a variety of separate instruments and jam over them or record your own guitar parts and songs. The most recent update has went far beyond my expectations. The ease of use is still there, but with many more instruments! They’ve added an FX feature which allows you to do studio quality effects, that bottom end you’ve been missing, and there’s a grid control so you can preset loops by recording your own samples in to the grid with what you’ve composed in the classic UI! If you’re a guitarist or bassist, you can get an adapter for like $20(USD) that allows you directly connect through various amp models, guitar or bass, with the ability to preamp your current setup, or use with headphones, AND you can use it to record your guitar and bass tracks! THIS IS A POCKET STUDIO. Seriously. It is an amazing bargain investment for musicians. Can’t go wrong for $5! Do it! Get it! Click buy! Jammit contains multi-track versions of popular songs from the past 50 years and using these you can isolate or remove an instrument from the mix, and jam with a band’s original master tracks. Other features include scrolling scores for the songs, the ability to loop a section, variable slow mode and a recorder for you to capture your own performances. 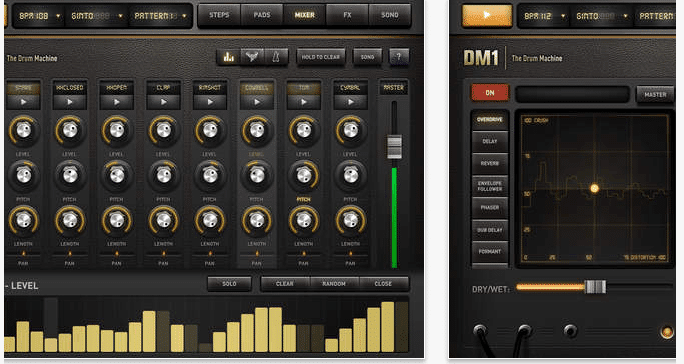 DM1 turns your ipad, iphone or computer into a beat making drum machine. It’s loaded with 99 electronic drum kits and is intuitive, fast and easy to use. You can quickly get together beats and grooves to play guitar to for jamming or composing ideas. Thanks for keeping this alive and up to date for so long. I use it every day. The interface just makes sense to me, more than other tools on the App Store. The only feature missing is the ability to import my own samples like in the iPad version. Not strictly for guitarists but if you wanted to create some drones for improvising modes over or synth style backings this is for you. 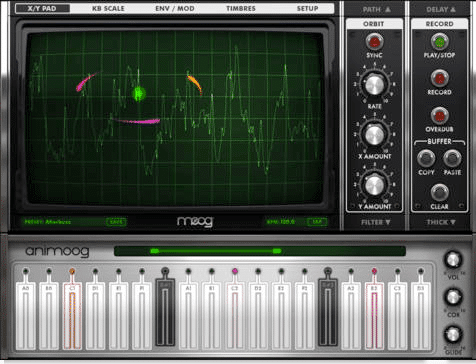 Moog synths are analogue classics and with Animoog they’ve come to the Ipad. Powered by Moog’s new Anisotropic Synthesis Engine, Animoog captures the huge sonic vocabulary of Moog synthesizers and applies it to the ipad enabling you to quickly sculpt fluid and dynamic sounds that live, breathe, and evolve as you play them. This is an absolutely superb synth, with incredible flexibility, wonderful presets, and fantastic tones. And it’s so much more than a synth; it’s a versatile sound manipulator and recorder. One of my absolute very favorite apps in the whole store. The design of the keys alone is revolutionary. With frequent updates and a built-in manual. Buy it at any reasonable price. Then buy the Minimoog, Devine, and Monster Moog expansions. 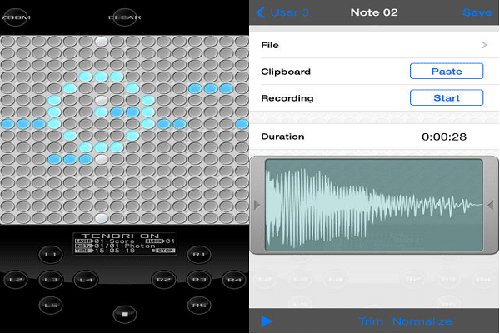 This is the iOS version of the inspiring TENORI-ON synth/sequencer instrument. 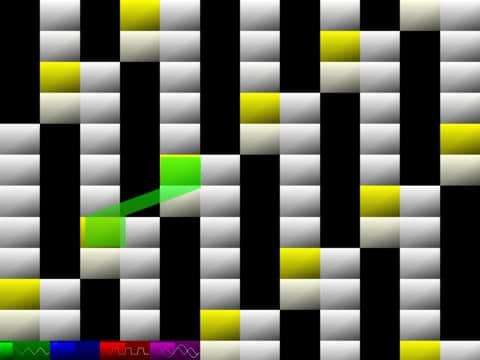 You can use it to lay sounds on a 16×16 grid of buttons that combine rhythms and melodies to produce music. TNR-i can produce 16 types of sounds at the same time, and can produce up to 16 blocks. It also features an intuitive a draw mode in which you can create and perform music by tracing your finger across the buttons as if you’re drawing a picture. It is great for quickly putting together an experimental track to jam with and fuse electronic sounds with your guitar playing. Geo Synth is a musical instrument and MIDI controller that is fast and easy to use. 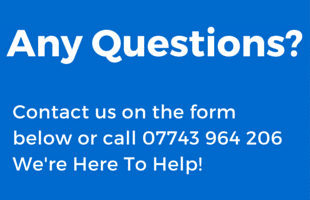 You can use it with any external MIDI instrument. 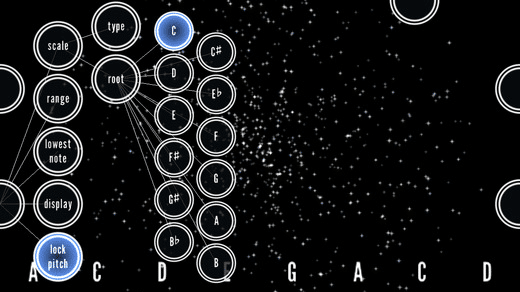 It also has a virtual MIDI feature that allows you to control an app running in the background on the same device. Hooray, Geo Synthesizer is back in the game for the iPhone 6s! The stuttering (due to the 6s higher native 48k sampling rate) is now gone. Kudos to the developer, who was very responsive to the issue. Great support on their part. Tachyon, is a dual-instrument synth for both iPhone and iPad. Developed by serial audio app developer Jordan Rudess (SampleWiz and Geo Synthesizer), Tachyon, much like Biophilia, features a space-inspired visual interface which reacts to user input. 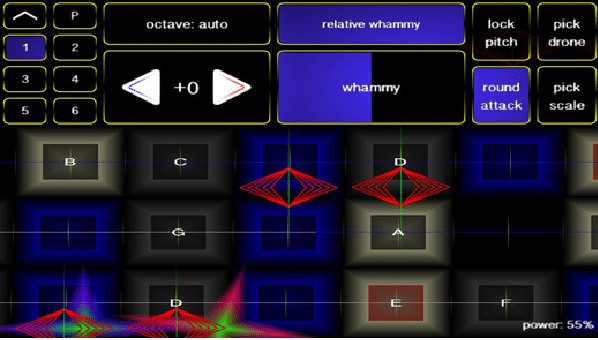 The app’s uniqueness comes from the ability to access two different synth instruments simultaneously – one at the top of the screen, one at the bottom. This app was recommended by an old school friend it’s a very low latency experimental synthesiser with an interesting and intuitive interface using an 11 string bass guitar layout. Another feature for the experimentalist or traditionalist is that it can work in microtones. If you’re using Mugician you’re in good company as it features on both Underoath’s ‘Disambiguation’ album and ‘The Fall’ by Gorillaz.